Hello, you! It took me a while to post this because I'd been busy making final changes to my blog, working on other content and getting caught up in non-blog-related activities. 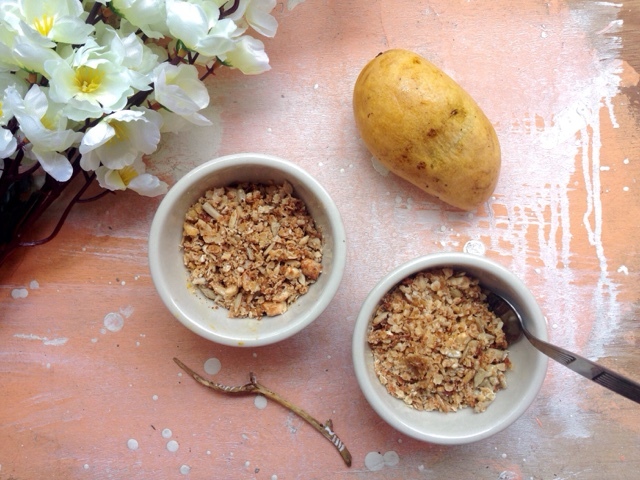 But as promised, here is the recipe for these wonderful coconut crumbles! This is actually derived from one of my favorite plant-powered humans, Lauren's Mini Berry version, which I tried making and enjoyed. I would love to invite everybody to try it out as well but because we pay a premium for berries in the Philippines, her recipe may not exactly be what we would consider the most practical -- especially if it becomes one that you'll want to keep making over and over again. So I decided an attempt to recreate it using substitute ingredients that are more affordable and accessible to us here. Thankfully enough, my version ended up being equally as good, but a whole lot easier on the budget! 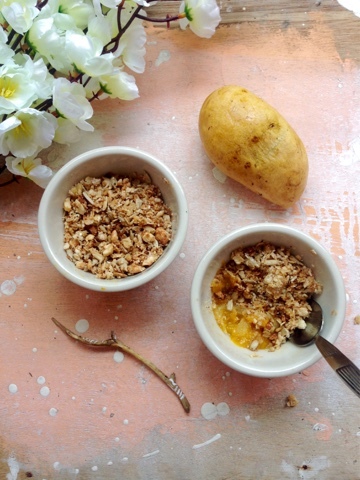 Now we can have fruit crumbles that any Pinoy could make worry-free! Instead of bluebs and strawbs, I used local mangoes and pineapples -- golden and sunshiny fruits which I think are two of the finest products that the Philippines can offer. I also added my personal twist of fresh ginger and cinnamon just because I adore their scent so much and I always think that they go so well with mangoes. I never thought they'd match well with pineapples too! If I were to describe these crumbles, I would say that they're like a cross between granola and porridge -- sweet, warming, homey and just oh so delicious. I know that this recipe is filed under "Breakfast" but to tell you the truth, I think these crumbles would fit better in the Late Night Eats category, if only I had that. Combine all of the ingredients for the filling in a saucepan and put over medium heat. Stir well so that the flavors incorporate. When the mixture starts to bubble, lower the heat and let simmer, still stirring frequently so it doesn’t stick to the pan. 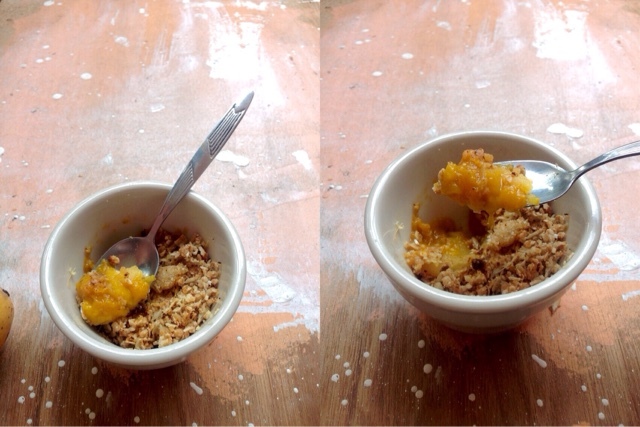 Start making the crumble by combining the ingredients in a bowl, mixing the dry ingredients first before the wet. Make sure that the dry ingredients are evenly coated by the liquids. 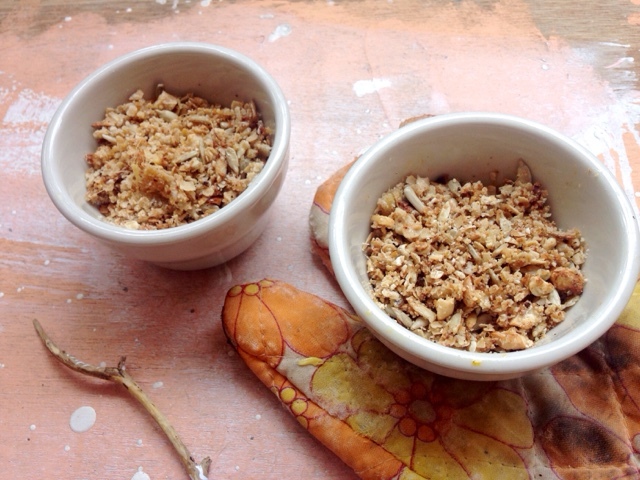 Sprinkle the crumble over a baking tray and bake for 10 minutes. Stir the mixture halfway so it doesn’t burn. Meanwhile, go back to the filling. The fruits should have softened and released their juices. Continue stirring until the mixture reduces and thickens, around 20 minutes. Once it’s reached a very soft consistency, pour the mixture into ovenproof dishes. Sprinkle the cooked crumble on top and bake for 5 minutes.